Left and Write: The Anti-Blogfest Gary Fest/Super Blogger Award! The Anti-Blogfest Gary Fest/Super Blogger Award! If there's one thing that's a constant in the blogosphere, besides blogging, it has to be the notion of the "blog fest/blog hop/award". For most of us, these are fun, a bit of a distraction from our usual blogging 'habits', and a great way to meet new blogging buddies as well as discover new blogs we may not have found, otherwise. I did say....."most of us". Gary, over at Klahanie, marches to the beat of a different blogging drum. While a very thoughtful, good natured, and engaging, blogger, he's not very keen on the whole notion of the 'blog hop'. This meant, of course, that someone, eventually, would dedicate one to him. 1. Pointy Sticks Meet Eyeballs Bloghop-- "Where you see the point coming...and that's the last thing you see." 2. The No Pitstops Blogfest-- "It's a road trip. A long, roadtrip...and we ain't stopping. We're also eating Taco Bell and drinking coffee so, warning, explosive results may occur!" 3. The Snakes In A Sleeping Bag Bloghop-- "Where there's a snake in someone's sleeping bag. Is it yours?" So, what three bloghops would you never participate in? If you want to see the list of participants and show 'em some love, you can find the info HERE. 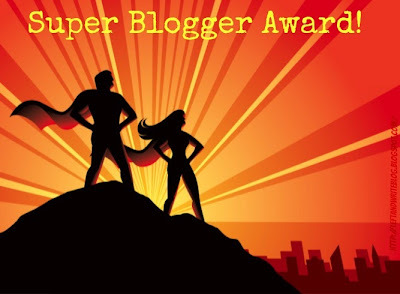 While we're on the subject of blog hops and blogging awards, I guess this is a good a time as any to award another "Super Blogger Award". Take the award for yourself, then pass it along to someone who inspires you or you just think is 'super' in one way or another. Tell us why you think that person is super and deserving. Now, all the recipient has to do is reveal a (as in one) small secret about themselves (super people always tend to have a secret or two, right?) and pass the reward on to someone they think is deserving. This one is going out to....you guessed it....our friend, Gary. Gary has been on the short list for this since I came up with it, for a variety of reasons. As I stated above, Gary is thoughtful and engaging in not only his blog, but his comments. He always replies to each and every comment left for him as well as making sure to return the favor by visiting others. His posts, while always heartfelt, are usually laced with a hearty dose of humor and sarcastic wit. I can't remember a time he's commented on this blog and I didn't have a grin or a chuckle from reading it. So, I just want to thank Gary for his contributions to the blogging community and hope he'll accept this in the spirit in which it's given. Gary, (and Penny! ), thanks for all you do and, please, keep on doing it! LOL! Mark, I'm am TOTALLY LAUGHING... your bloghops are hilarious! Glad Penny got a mention here! Gary is a 'super' guy. Dude, you get the "oh yeah" award for joining "GaryFest" AND giving him a blog award, too !!! I BUL'ed all over my adult beverage. Hi Mark - well those anti-blogfests would beat me out of the arena .. I don't often participate - but I would definitely be running in the other direction ..
Great thoughts here - and the Gary Award .. fun - well this is going to keep Penny busy for the rest of the week .. I'm laughing at your blogfests and at Mark K's free entry comments. Great job. This was very fun and kinda sent a chill up my spine --especially the pointy sticks one. Gary is well deserving of that award. Thanks for joining this party. Now I'm going to have nightmares about "snakes in sleeping bags!" This was a wonderful tribute to Gary and he is definitely deserving of the award (should he decide to accept it)! Excellent blog hop ideas :) I'm really enjoying checking out the blogs I follow today! Congrats Gary on both a bloghop and an award. You came up with some good ones Mark. Double whammy for Gary today - blogfest and a an award! Hilarious, Mark. You truly have me rolling. Great sense of humor. I love coming here when I can! No pitstops? I would die. @Nancy: LOL! Well, if I had thought of trying some videos, I might have :D Thank you! @Suzanne: Oh yeah, can't forget Penny! @Mark: Well, Mort, it looks like you've developed a stutter...but that's ok...it's a two for one sale on comments today :D I haven't BUL'ed yet, but I like that one! :) Thanks for hosting! @Robyn: Thank you and thanks for hosting...fun hop! @Alex: Yes, I figured I'd hit Gary with a one-two punch....digitally speaking, of course :) Thanks for hosting this! @Diane: Me too..especially with coffee and Taco Bell in the mix! You described Gary very well, and how perfect to give him his award today! I'll avoid that road trip hahaha. This has to be one of the worst blogfests so.far. But hey, you can always.roll.down the window. Just hope there is not a cop behind you. HA! The point is the last thing you see coming! Nice! It's all fun and games until someone loses an eye, eh? And yeahno on the snakes... not playing that one! Gosh, Mark! This is too funny. Is the second bloghop with windows open or closed? That's a critical factor, you see? Hahahhahahaha. Great entry! i laughed so hard on the "#2"... i so been there... was not a fun way to travel..
or is it more pc to say... going #2 referring to the driving part and going? No Pitstops sounds pretty disgusting though not as painful as the other two. I don't think I can top your 3 hops. Those are pretty out there. He now joins the likes of Alex with a having a bloghop named after him! I wouldn't be joining any of your hops. Like Gary, I am not all that into blog hops in the first place, but these are terrible. Congrats to Gary on the award! That is awesome!!! You had me laughing all the way through Mark! I was here really early and forgot to comment. Your imagination is funny. Hey there is already a song starting out like that. Good writing, Mark. I did all of them, took Cody for a walk and now get ready for a flamenco class. It was fun and I don't do a lot of them. Yeah, don't see the point coming...when blinders should not have been removed. No Pitstops? Me No Ride With U. And snakes...oh, slither me timbers! Gary is great. I sort of wish I could have a timeshare with Penny. Such a cutie. Man, that second blogfest might be a little bit too uncomfortable for my liking. I do like me a crunch wrap supreme, though. Numms. Thanks for commenting on Sara's post about my book today. Hear hear to support. I may not sleep in a sleeping bag again. Oh NOOOO! Suffering a flashback here. I've kinda lived that second one when our kids were young, and my husband wanted to make the drive from GA to MD in as short a period of time as humanly possible. No thanks. Don't care to relive that experience. HA! Once we got stuck on the beltway during the work traffic and it was a little like your blog fest! Very imaginative Mark! Too funny! I'm liking Gary more and more! Do not have a hop if it involves snakes! Please. I'll that the Pointy Sticks Meet Eyeballs instead. Eye almost see the point in your first non-choice. The second one I drove right by. Kinda' like a drive-by blogger who leaves a vague comment in hopes you will go to their site and follow their blog. The third one almost becomes an innuendo. Seriously, thanks for bestowing your very thoughtful award on Penny and me, her alleged human. Your words are kind and I do appreciate our ongoing positive interaction, Mark. I shall duly slap up this award in an upcoming posting. And yay, thanks for the irony. Dude, you are killing me with those bloghops, especially the "explosive" taco-bell, caffeinated bloghop. Wow, I think I was on that hop before blogs existed...wait, nevermind, that was Grateful Dead tour. Gary is definitely an awesome commenter and deserving of the award and ironic blogfest. @Stephen: I'm not sure even an open window would help with that one! @Susan: Unless you're the one having to make the pitstop...then it could get sort of painful! @Samantha: Heh, I sure wouldn't either! @Maurice: haha, thank you sir! @Julia: My pleasure and best wishes on the new book :) That's the thing...I make fun of Taco Bell, but it -is- sooo good! @Trisha: Thank you and don't worry...I wouldn't go near them, either! @Susan: Actually, I got the idea from years of car trips when I was young with my mom and dad. One time, my dad was refusing to pull over and handed me a coke bottle (I'm not kidding). My mom hounded him until he did pull over, though...lol. @Elizabeth: Thanks and I know the feeling. Nothing worse than getting stuck in traffic and then getting 'that feeling'...ugh! @Misha: LOL....thanks and same here. @Lee: Hmm...yeah, it would be a tough call! @Ella: Thank you very much and I'm glad you enjoyed! Gary so deserving of the Super Award, but I'm sure he'll just grumble! Maybe we need a grumbler award! those are some very uncomfortable bloghops! and yay for super gary! That is awesome, I must admit it has taken me a while to enjoy the blog hops. I am still laughing at your second one. The entries for this fest are so fun to read. I'd never make it on that road trip. Everyone I travel with hates me because I want to stop about 5 minutes after we leave the house LOL. I will be visiting here again though. :) Just dropping by to wave hello. But no pitstops? Oh, no! Your three bloghops are really hilarious. Snakes in a sleeping bag (shudder, shiver).